Concerns about immigration were not the only reason why a small but significant majority of the British electorate voted to leave the European Union in the referendum of 23 June 2016. But concerns about immigration were certainly a major factor. Polls which asked people why they voted for Brexit soon after the vote recorded that the primary concern of those who opted to leave was that they agreed with the principle that ‘decisions about the UK should be taken in the UK’. Second on the list was that leaving the EU gave Britain ‘the best chance of regaining control over immigration’. Those two motives for voting ‘Leave’ are closely related: immigration is obviously a decision ‘about the UK’, and one about which the British people have frequently told pollsters that they are very concerned about. 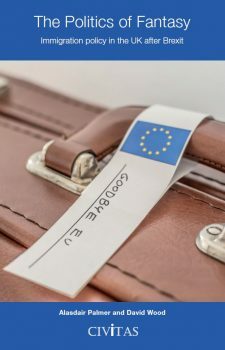 Complying with the policy of ‘free movement’ – the idea that every citizen of every EU country should be free to move so as to work and study in all of the others – has become a necessary condition of membership of the EU. Slightly fewer than half the total number of additional immigrants to the UK every year come from EU countries. So, while Britain remains a member of the EU, its government can only impose controls on citizens from non-EU countries intending to live, study or work here for more than a year. Which may be one reason why 52 per cent of those who voted in the Brexit Referendum cast their vote in favour of Britain leaving the EU. Theresa May, who took over from David Cameron as Prime Minister after he resigned once the result of the Brexit vote was clear, has interpreted the majority in favour of leaving the EU as an instruction from the electorate to reduce immigration significantly. At the 2016 Conservative Party Conference, she insisted that exiting from Europe meant exiting from the principle that citizens of EU countries should be free to move to the UK if they chose to do so. ‘We are not leaving the European Union’, she insisted, ‘only to give up control of immigration again.’ During the 2017 election campaign, she repeated the same message many times, stating (for instance) on May 8 that ‘When we leave the European Union, we will have the opportunity to make sure that we have control of our borders – leaving the EU means we won’t have free movement as it has been in the past.’ The Conservative Party Manifesto for the General Election she decided should take place on June 8, 2017, re-iterated the promise, made by David Cameron in the election campaign in 2010 and again in 2015, to reduce immigration to ‘tens of thousands’ a year. One of the questions we will try to answer in this pamphlet is the extent to which the British people, as represented by their Government, will gain ‘control over immigration again’ once Britain has formally left the EU. Theresa May was Home Secretary from 2010-2016. She was responsible for reducing immigration to ‘tens of thousands’ a year. She failed, despite implementing a series of policies designed to have that effect. Net migration (the number of people settling in the UK, minus the number leaving it) was 327,000 for the year March 2015-March 2016: 71,000 higher than when she arrived at the Home Office in 2010. We accept that Mrs May and her administration are correct to claim that she will have a mandate to reduce immigration. We take it that, were Britain’s exit from the EU to have no effect on immigration – were it to fail to reduce the number of people who are not British who arrive in the UK each year with the purpose of settling and working here permanently – most of those who voted in the referendum would feel that the Government had failed to respond to their wishes. Rightly or wrongly, they would regard it as a betrayal: not only of the majority who voted for Brexit, but of democracy itself. Rather than either endorsing or criticising the majority’s apparent belief that native Britons must be worse off with high levels of immigration, our purpose is to examine carefully what, in terms of concrete and effective policies, the Government can do to keep its promise to reduce annual net migration to below 100,000. Will anything actually work to achieve that result? What will be the costs of effective policies? Will the costs – economic and otherwise – outweigh the benefits? And are British taxpayers prepared to pay those costs? If they are not – should they be? David Wood joined the Home Office in 2008, serving as deputy CEO of the UK Borders Agency and was subsequently appointed Director General of Immigration Enforcement. He left the Home Office in December 2015 and is now a Director of BGS Ltd, a global security company. Prior to joining the Home Office he was a police officer, rising to deputy assistant commissioner of the Metropolitan Police. Alasdair Palmer was Theresa May’s speech writer when she was home secretary. Prior to that, he was a leader writer and columnist for the Sunday Telegraph. He also worked for the Spectator (where he was home affairs editor), and Granada Television. His articles have appeared in The Times, the Daily Mail, the Wall Street Journal and other publications.